This concept was inspired by the photographer, Melody Joy. She and I met at a coffee shop to discuss collaboration opportunities and she mentioned that she would love to shoot a unique bride who wanted to get married at a coffee shop. Melody's Instagram is well known for her beautiful photos of coffees and coffee shops, so she was the perfect fit to be our photographer. I'm also a former barista and coffee enthusiast, so this theme was very fitting. 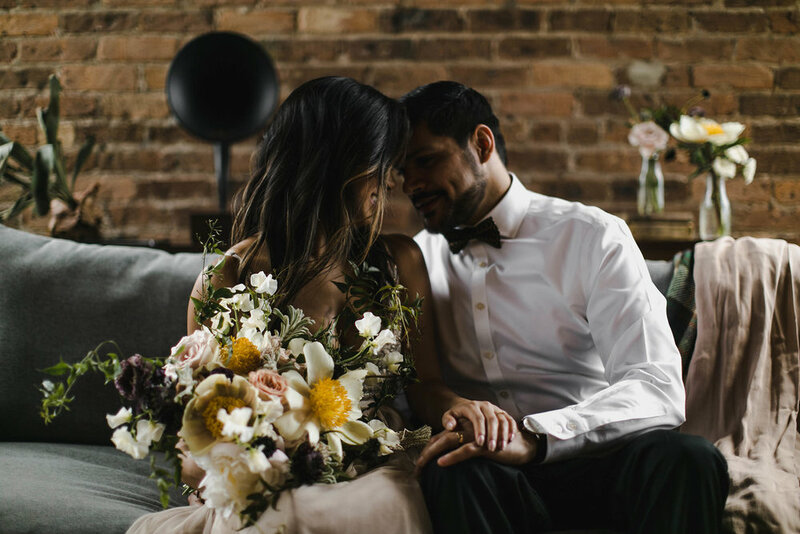 We wanted the elopement shoot to be very intimate and cozy, somewhat casual but still elegant, and full of beautiful details to inspire other coffee-loving couples. 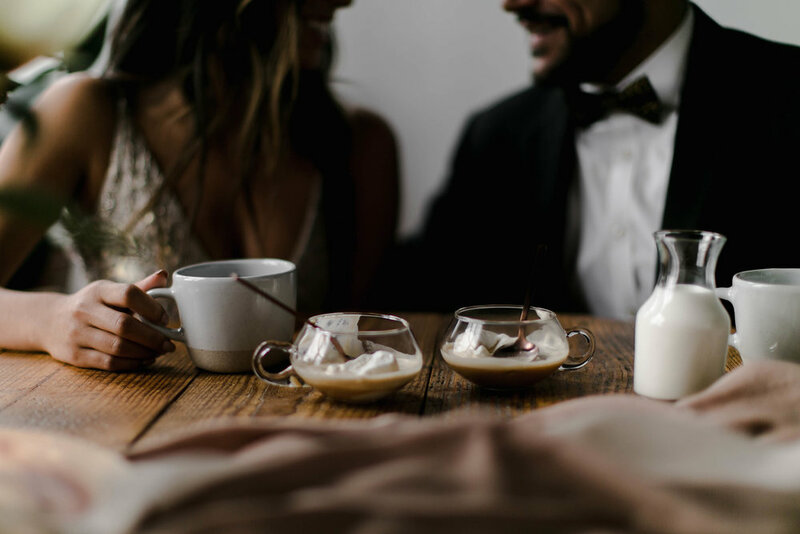 We incorporated details such as affogatos, Chemexes, and even a violinist to serenade the couple. The team of incredibly talented vendors are all local to Chicago and the models are personal friends of some of the vendors. The aesthetic and styling was inspired by the many moody and warm coffee shops in the Chicago area. This was also kind of a dream opportunity for me to be able to plan and organize the shoot and develop all the paper goods and calligraphy for it! I had all the freedom I wanted to design, and it was wonderful. Donna from All Dei Events did an amazing job styling all the details for the shoot. She truly has a great eye, and is such a sweet person. Also, I now offer that hand-painted "I Love You and Coffee" piece here in my shop! Yay! Not only are Grace's desserts beautiful, that cake was AMAZING. And I'm not a huge dessert person (for real), so believe me. It was good. That fabric banner was a last minute creation (the night before) but I'm so glad I decided to make it! It really helped bring the sweets table together. I mean.. all of the amazing details! The flowers. The delicate ring. The sweet sweet couple. Brie absolutely knocked it out of the park with the bouquet, and Katie's rings added the perfect delicate moody touch. Tran did a lovely job with the hair and makeup for our model. Pretty and timeless, but fit in perfectly with our moody and cozy vibe. Working with all the moody tones and metallics made me so happy. And that custom watercolor liner? One of my favorite parts about this suite. Thank you to Workshop Chicago for the use of your beautiful and versatile space. I always have a great experience with them, and highly recommend them if you're in the Chicago area! Lastly, please do yourself a favor and order a bag (or two) of Good Manner's coffee. They're a very small home-roasted coffee company, but is one of the best coffee companies I've ever tried. It really was so wonderful to collaborate and bring together all these talented Chicago vendors! Looking back at all these photos makes me so happy and has me wishing I could do it all over again.